…and what did I find? Charm again. “Not quite my cup of tea,” I thought; “this is too English.” I have the fancy for rather spicy things, you know, not for the shade of the cedar tree, the cucumber sandwich, the silver cream-jug, the English girl dressed in whatever English girls do wear for tennis—not that, not Jane Austen, not M-m-miss M-m-mitford. Then, to be frank, dear Charles, I despaired of you… and Charles—I speak of your art, my dear—is a dean’s daughter in flowered muslin…. Edward Bawden, The Bell (1949), color lithograph from six hand-drawn zinc plates, 9.8 cm x 15.5 cm. ©The Estate of Edward Bawden. Having sat through any number of devastating art school critiques since the early 1980s, I must admit that Anthony Blanche is the meanest, most focused and most delicious critic I have ever encountered. He dismisses Charles Ryder’s paintings for their “charm,” an epithet that, like “tasteful” or “polite,” is both damning and irrefutable when applied in the pejorative sense. I know this from experience. Ryder and Blanche are fictional characters, and the failure of Ryder’s art is a driving force in the plot of Waugh’s great novel. It has proven impossible to find a real life model for his artist, though many attempts have been made.2 But the question of charm as a negative characteristic of English art of the 1920s and ’30s is nonetheless very real. Within the field of prints, it could be said that Eric Gill, Gwen Raverat, Laura Knight, Stanley Anderson, Robert Austin and Graham Sutherland all sought a style that defied Continental modernist developments with a specifically English charm. Even in the brilliant linocuts of Cyril Powers, Sybil Andrews and Lili Tschudi, modernism is tempered with a wit and aplomb that is irresistibly charming and unmistakably English. Edward Bawden’s work from the middle 1920s to World War II presents a highly individual perspective on English subjects and visual traditions viewed through modernist forms and techniques, especially those coming from France. Bawden, born in 1903, was part of a generation too young to participate in World War I and who developed new styles while studying in the 1920s.3 Trained at the Royal College of Art alongside his great friend, occasional collaborator and sometime rival Eric Ravilious, he studied with John Nash and developed a broad range of skills that allowed him to work professionally in many art and design fields. 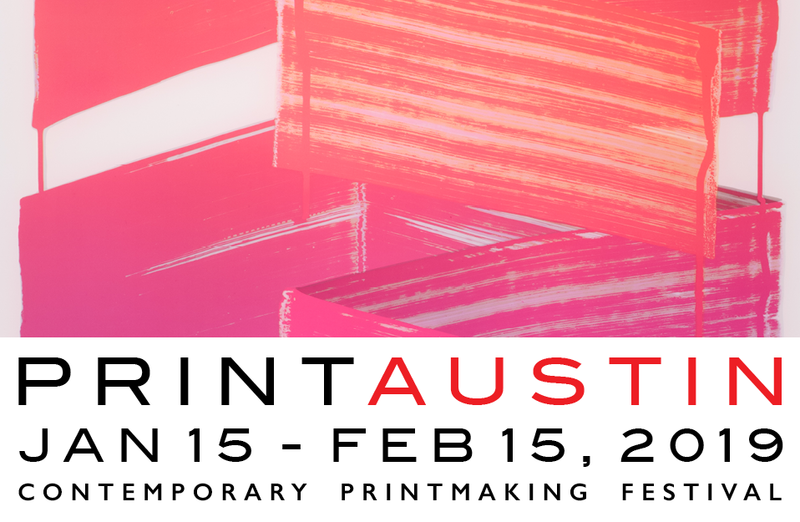 His achievements in poster and advertising design and book illustration are balanced by his highly innovative prints, especially linocuts. 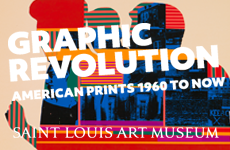 His deeply individual graphic/painterly vision was expressed in his lifelong practice of watercolor. In the William Morris tradition, he would take any job—beer label, wallpaper, Wedgwood dinnerware, murals for ocean liners, tapestry for an embroiderers guild—and bring to it professionalism, wit and of course charm. Perhaps his closest American corollary is Rockwell Kent, who also excelled at so many aspects of fine and applied art. Edward Bawden, A Man from Benghazi: Pte Mohamed Libyan Labour Corps. 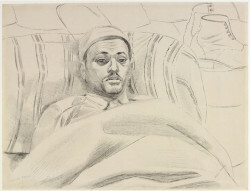 South African 18th Casualty Clearing Station, Maaten Bagush (1941), ink drawing, 50.9 cm x 63.7 cm. Image ©Crown Copyright: Imperial War Museums. ©The Estate of Edward Bawden. If Bawden’s career had ended in 1940 he would still be one of the most memorable British illustrators of his time. His posters for the London Underground and Shell and his illustrations for novels and cookbooks mix an appreciation for Victorian popular art (Richard Doyle, Staffordshire ceramics, printed ephemera and decorative arts) with a sophisticated application of modernist influences, such as the engraved illustrations of Jean-Émile Laboureur. Individuals are simplified to types and scenes are reduced to their most characteristic graphic forms, rendered in a dry, slightly askew manner that is funny and a bit reticent. By the start of World War II, Bawden was a mature artist, with a reputation as an illustrator and designer, and a successful exhibition record for his watercolor paintings and prints. He had settled in the village of Great Bardfield in Essex, acquiring Brick House, a large 18th-century residence on the principal street. He married the potter Charlotte Epton and started a family, creating a hub that began to attract other artists to Great Bardfield, notably Ravilious and John Aldridge. When this secure world was disrupted by war, Bawden became an official war artist, a post that took him far from village life and the professional concerns of his cozy circle. The immediacy of his work from Egypt, North Africa and the Middle East—his vivid portraits of living individuals, the settings and purposeful activities depicted—show an artist shaken out of complacency, a reserved person forced to interact closely with others. Bawden maintained his fastidious touch under the most difficult circumstances, but new elements of human sympathy and increased curiosity in the face of the larger world dominate this work. 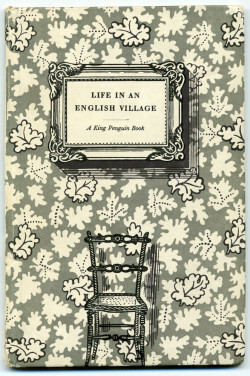 Edward Bawden, Life in an English Village: Sixteen Lithographs by Edward Bawden with an Introductory Essay by Noel Carrington (book cover) (1949), letterpress in three colors, 18.3 cm x 12 cm. Printed at Curwen Press, Plaistow, London. Published by Penguin Books, London. ©The Estate of Edward Bawden. The Bawden volume consists of four elements: the cover, the short text by Carrington, six line drawings interspersed through the text and 16 color lithographs printed by Curwen Press. Unique among Bawden’s illustrated books, it is driven primarily by images. Though the lithographs are printed on both sides of paper that is far from deluxe (a reflection of postwar shortages), the book is a gem of artistry and design. It is a seductive object that promises delight, yet close examination reveals a serious work that questions its quintessentially charming subject, English village life. The cover is a three-color relief print of deceptive sophistication. Across the front and back boards, a gray-green background gives way to unprinted paper in a subtly repeating pattern of oak leaves, some completely outlined or articulated with veins dotted in dark gray. The foliage seems to have tumbled out of a Matisse cutout to occupy a Victorian parlor. In fact, the pattern is similar to the linocut wallpapers Bawden designed in the 1930s and installed in his own home.5 The wallpaper reference is made explicit by the old-fashioned rush seat chair set against the patterned wall and surmounted by an ornate picture frame that contains the book’s letterpress title. These objects, printed in a shiny dark black, cast deep gray shadows on the wallpaper and are slightly offset to the left so that object and shadow together are centered. The cover wittily proclaims the artist’s sensibilities, a synthesis of old and new, with verve and humor. 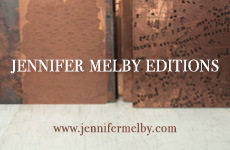 In contrast, the plain endpapers strike a note of austerity, and the title page is conservatively set in the letterpress style of a 19th-century tract. The fanciful decorations and inventive hand lettering that characterized Bawden’s book work of the 1930s are absent. The small font used for Carrington’s essay is made legible by perfect spacing and layout, a tribute to the unobtrusive craftsmanship of the printers at Curwen Press. After the inviting appeal of the cover, the typography is deliberately sober. Left: Edward Bawden, Teapots (1949); Right: Staffordshire Figures (1949); photomechanical relief prints from line drawings, 15 cm x 9.2 cm each. ©The Estate of Edward Bawden. Carrington’s essay begins by mocking the idealized view of the English village as seen from a bicycle or motorcar by the city dweller seeking a change of pace from the strains of the metropolis. He recounts the decline of agricultural life, from the small landowners of Tudor England to the impoverished farmers who ended up in 19th-century workhouses. He chastises English novelists from Jane Austen and Anthony Trollope to Nancy Mitford for depicting the village only from the position of aristocratic landowners. Finally he expresses hope that postwar social movements might give new autonomy to residents of small agrarian towns. 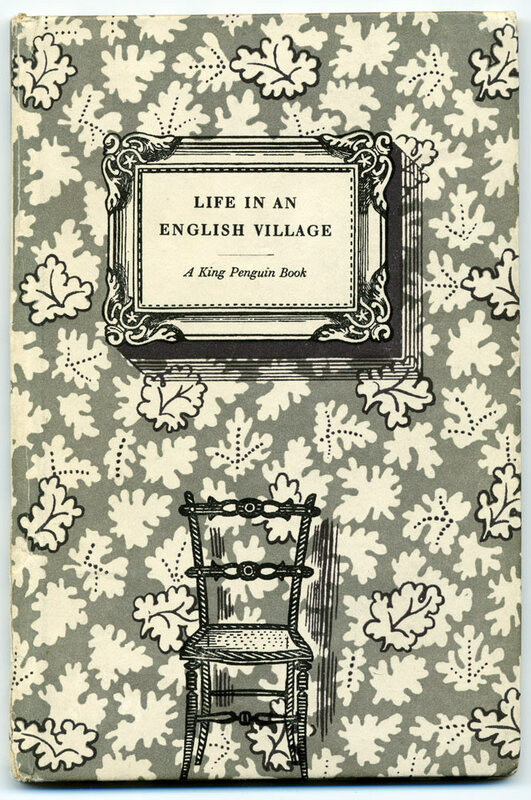 The essay mentions Bawden only once in passing, but sets the stage for a more contemporary view of village life. Inserted within the letterpress text of the essay are six relief cuts, photomechanically reproduced from Bawden’s ink drawings. These vignettes of antique objects and near-obsolete handcrafts succinctly express nostalgia for the seemingly stable, prosperous world of Victorian England: five oil lamps shining in the moonlight with a couple of gothic arches in the background; a table covered with Staffordshire ceramics (a shepherdess spill vase, a Scotsman and his lass, tame and wild animals, Napoleon, a phrenological head); rickety wire plant stands interspersed with ivy; straw sculptures (“corn dollies”), including an anchor twisted like a strand of DNA; marching rows of English teapots on a patterned tablecloth with steam rising in the background; a pile of handwoven baskets, useful and ornamental. A confident line and rigorous compositions capture the objects’ spooky sentience. Bawden collected these things and lived with them. I understand his impulse, having acquired 19th-century British ceramics and decorative arts with similar characteristics myself. Their infinite charm seduces me as it seduced him. They have a vivid presence that belies the fact that they represent an era that can never be reclaimed (an era that was, from a medical and sociopolitical point of view, pretty dreadful). 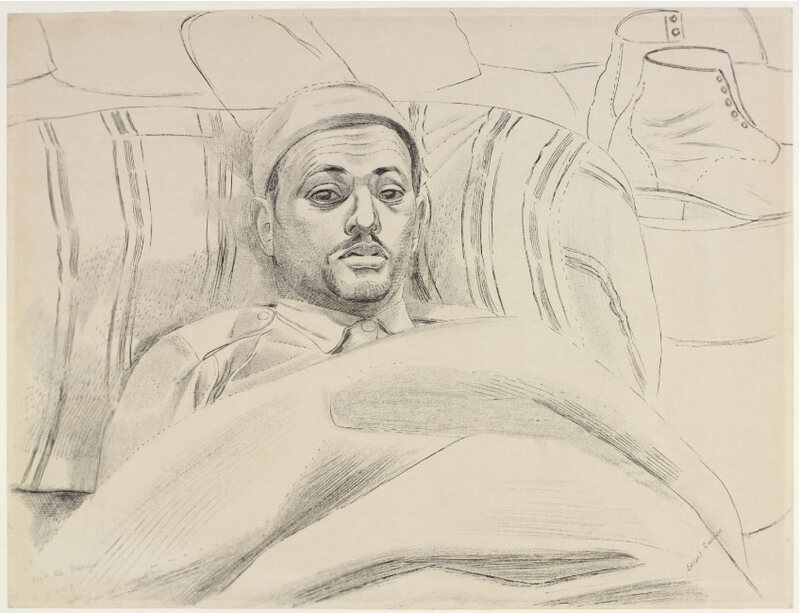 The elegiac quality of these drawings is quite different from the liveliness of his work in the 1930s. The salt shaker and celery glass Bawden drew as a tailpiece for the cookbook Good Food on the Aga in 19336 may indeed be Victorian, but the fly that perches on the glass rim and the freshly cut cucumber within add a sense of transience and quickness that is absent in the six English Village cuts. Top to bottom: Edward Bawden, The Vicar; St. Mary the Virgin; The Methodist Chapel (all 1949); color lithographs from six hand-drawn zinc plates, each 9.8 cm x 15.5 cm. ©The Estate of Edward Bawden. Bawden opens with “The Vicar,” a stooped, bald man, seated at his desk, procrastinating by gazing out the window as he writes his sermon. Despite the comfortable study, nicely appointed with antiques and religious objects, and his stature in the village, the vicar seems small and faintly defeated as he takes on his weekly task. On the following spread two churches are being cleaned. The pretensions of “Saint Mary the Virgin”—clearly the Anglican church ministered by the vicar—are evidenced by the richly ornamented baptismal font, pulpit and elaborate stained glass windows. “The Methodist Chapel” on the opposing page is distinguished by its plain decorations and prominent heating system. The social positions of the two churches are distinctly different but the women cleaning them are practically interchangeable. There is a humorous contrast between the industry of the cleaners and the lethargy of the vicar, but the issue Bawden points to was a serious one: do religious leaders have the vision to shepherd their flocks into the postwar world? The busy generation pictured in “The Junior School” and “The Child Welfare Institute” on the next spread will not directly remember what England was like before the war. But the two scenes of private life that follow focus on people of middle age. A stout woman peels potatoes for dinner in a below-stairs kitchen. Drying laundry hangs about her head and two cats keep her company. Her brow is furrowed as she concentrates on her work. In the middle-class sitting room of “Sunday Evening,” on the other hand, the boredom is palpable. Two women resign themselves to reading while the man smokes his pipe by the hearth. Sporting prints and taxidermy trophies suggest an active life, but the clock reads 5:40 and it looks like it will be a long evening. All these depict actual people. In his book on Bawden, Malcolm Yorke identifies most of them by name.8 The vicar was Mr. Cartwright and the study was the space where he worked. 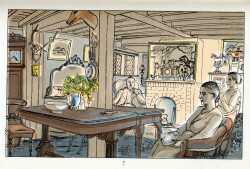 The woman peeling potatoes is Bawden’s charwoman, Mrs. Cuttle, and the Sunday sitting room is that of Mr. and Mrs. Ives and Mrs. Ives’ sister. 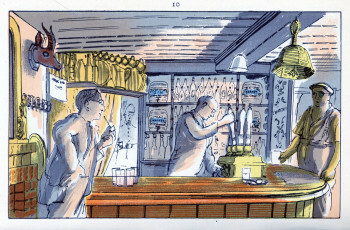 Bawden had sometimes included people he knew in earlier projects. 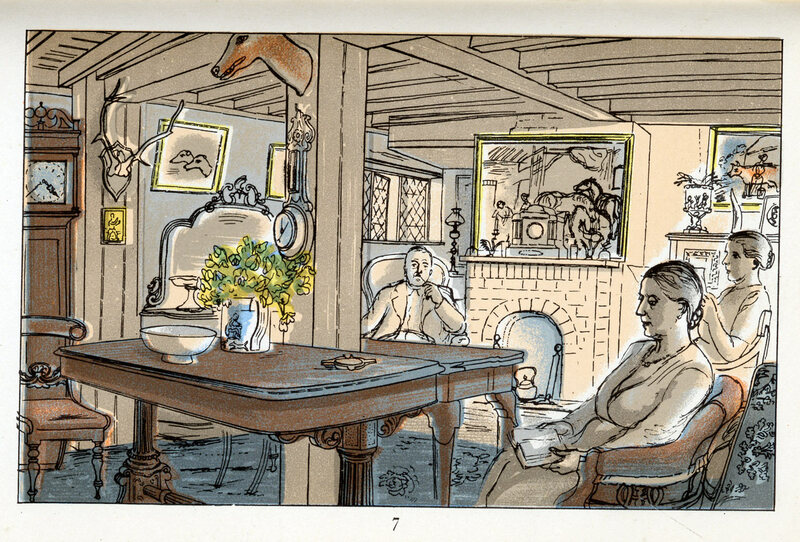 The “May” headpiece in Good Food on the Aga shows Thomas Hennell, Ravilious, Bawden and Ravilious’ wife, Tirzah, at a picnic, but a light narrative tone is established by the outsize plants and the reductive quality of the characterizations. The social critique implied in Life in an English Village—and the sense of people who are more than decorative devices—was new. Edward Bawden, Sunday Evening (1949), color lithograph from six hand-drawn zinc plates, 9.8 cm x 15.5 cm. ©The Estate of Edward Bawden. The remaining nine lithographs deal with commerce and trade. Friendly shops seem well-stocked despite rationing, the pub hosts a range of characters including a policeman, the one-eyed maker of corn dollies—one hangs from the ceiling—and Bawden’s friend and fellow artist John Aldridge, who looks on in a wry observant manner. This congeniality is noticeably absent in places of manufacture, whether the workers are shown in groups (“The Agricultural Machinery Repair Shop,” “The Baker”) or in solitary pursuits (the tailor cross-legged on his table, the harness maker turned cobbler in “The Saddler’s Shop”). Bawden respected the workers’ earnest concentration, but he was no social realist celebrating the triumphant heroism of labor. They seem to struggle against present privations and future obsolescence. No victory will come of their work, however worthy or well done. Throughout the book, the narrative tone is detached, with a tinge of irony. Though Bawden lived for decades among the people of Great Bardfield he was not from there and his professional work was centered in London. He and the artists who joined him always stood somewhat outside the village community. I know the feeling: as a transplant to New England, I know that I will never really be “from here” in the eyes of the natives. Bawden’s willingness to expose himself to the charge of satirizing his neighbors implies personal risk. Or perhaps his representations were so accurate that his subjects would not have noticed the social commentary. 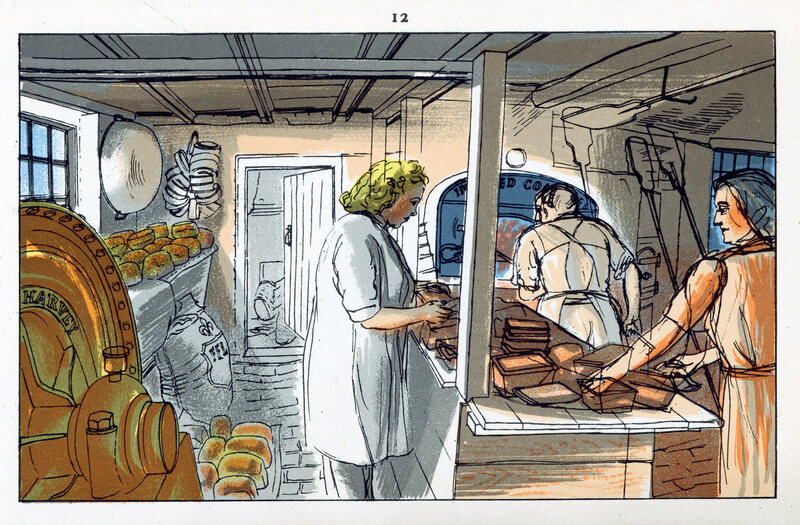 Edward Bawden, The Baker (1949), color lithograph from six hand-drawn zinc plates, 9.8 cm x 15.5 cm. ©The Estate of Edward Bawden. 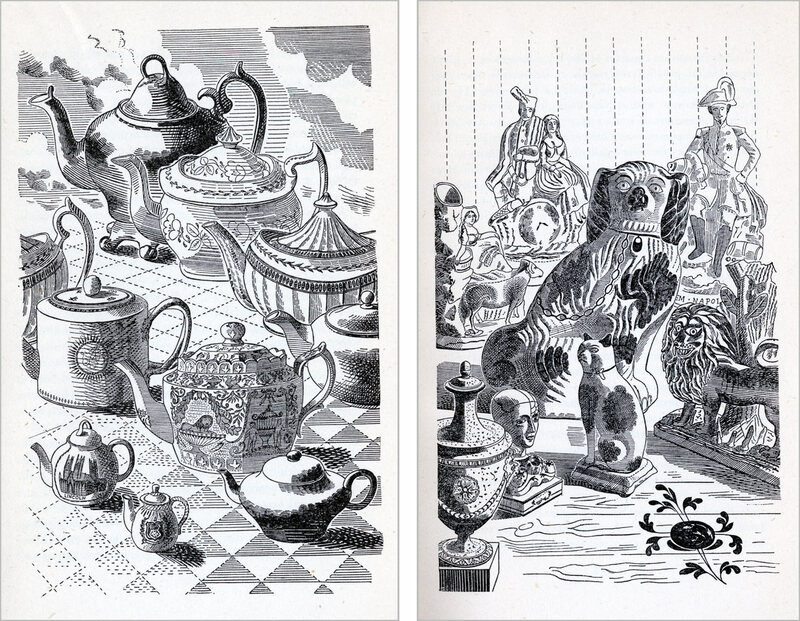 The complex content of Bawden’s lithographs subverts the simple nostalgic delights promised by the cover. This book’s ultimate refusal to charm, its subtle ambiguity, has prevented it from becoming the best loved of Bawden’s works despite being apparently the most deeply felt. 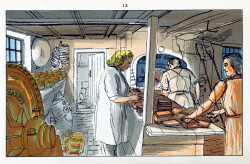 Even Yorke, Bawden’s great supporter, had reservations, preferring the line illustrations to the lithographs, which he describes as “sixteen autolithos in four rather unattractive colours over sharply literal pen drawings done on the spot.” Life in an English Village is unfavorably compared to High Street, a 1938 children’s book about shop windows with text by J. M. Richards and color lithographs by Eric Ravilious.10 This difference in popular approval comes as no surprise. High Street embodies a pure and unadulterated English charm that was perhaps possible to believe in that last moment before the war. Life in an English Village tears charm to shreds, replacing it with a sober view of a world that was about to change forever. Bawden remained highly visible in British art until his death in 1989. Commissioned works included murals, illustrated classics for the Folio Society and his many delightful catalogs for Fortnum and Mason. But he also exhibited watercolors and prints at the Royal Academy every year from 1948, and continued to be involved with the Royal College of Art until he was 75 (he was a great admirer of David Hockney), and his influence remains stealthily pervasive. It is hard to imagine prints such as Grayson Perry’s Map of an Englishman (2004) or Map of Nowhere (2008) without the influence of Bawden’s particular touch with image and text, not to mention the relationship between his Bunyan’s Dream tapestry of 1977 and Perry’s recent work in that medium. The strength of this legacy came home to me when the artist Bob and Roberta Smith visited Providence for a lecture. At lunch we discovered we were both Bawden fans, which made perfect sense given the dry wit and inventive play with lettering they share. For my part, I have found that Life in an English Village embodies much of what I aspire to in my own work. Bawden’s perfect calibration of gesture and expression imbues his figures with subtle qualities of concentration, resignation and patience, represented without theatricality or evident self-consciousness. Every object and space is selected and presented in a way that highlights its significance in the scene. Through 23 modest prints in several media, visual languages and points of view, Bawden orchestrated a deeply considered meditation on the past and present. Anthony Blanche rebuked charm because he saw it as diffidence that masked honest response to experience, substituting something that is intended to please, but that ultimately disappoints and irritates because it is shallow and patronizing. We will never know whether the fictional Blanche ever returned to the real postwar England of Clement Atlee, because Waugh declined to write a sequel to Brideshead Revisited. It remains a singular achievement among his novels, as Life in an English Village does in Bawden’s oeuvre. But I like to imagine that if someone had pressed a copy of this small book into Blanche’s hands he would have recognized the world of his time, presented with integrity and rigor. Left: Jean-Emile Laboureur, Chrysantheme D’Exposition, illustration from Pages à Mon Goût by Gilbert de Voisins (1929), engraving, 12.5 cm x 11 cm. Published by L’Artisan du Livre, Paris. Right: Edward Bawden, The Market Gardener (1949), color lithograph from six hand-drawn zinc plates, 9.8 cm x 15.5 cm. ©The Estate of Edward Bawden.